This is what we do in the "off season". 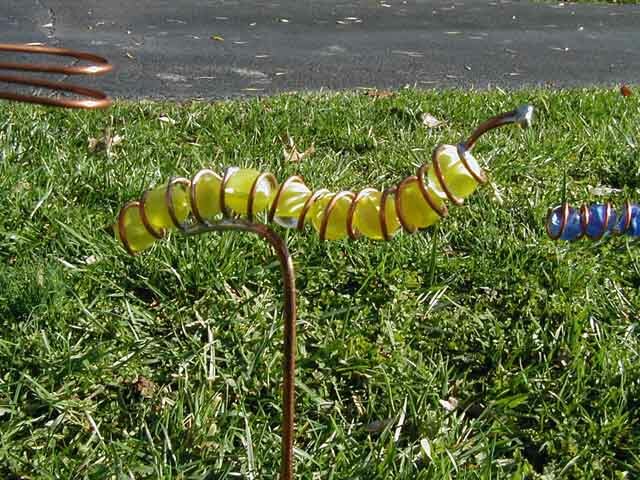 We started out making these little wire and marble caterpillars but have moved on to larger items. This marble caterpillar is the basis for several other marble insects. It's simply some #12 copper wire that's been wound around a 1/2" dowel rod and then stretched slightly. Then just pop in the marbles and solder to a heavy wire stand. This stand is #8 wire. 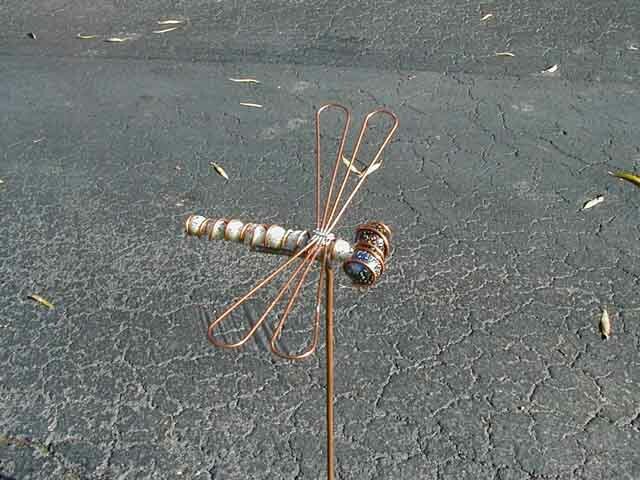 This dragon fly is a "worm body" with the addition of 2 larger marbles for eyes and wire wings. 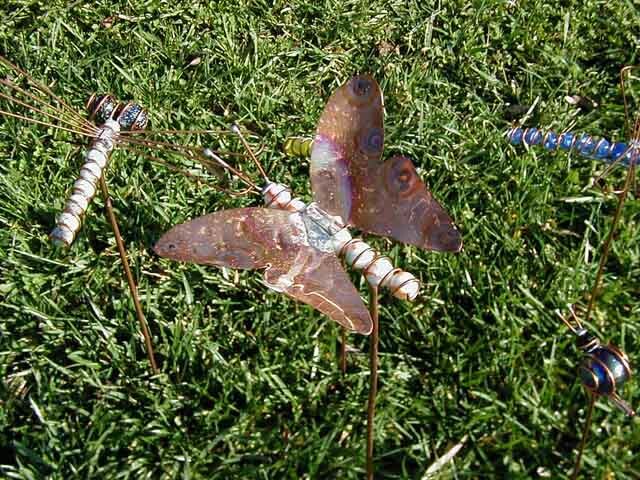 To make a butterfly add copper flashing material cut into a pair of wings to the basic "worm body". Make your caterpillars as long as you like and give them a wave shape to make them appear more animated. Start with a large "shooter" marble to make the snail body. 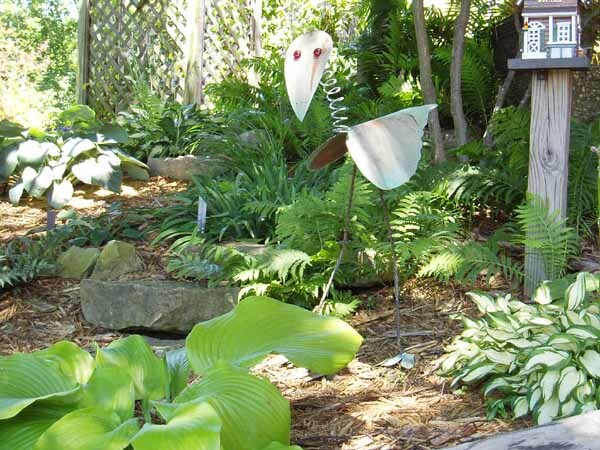 Wrap the large marble with wire to form the serpentine look of a snail's shell. This spider web is hung on our deck to contrast against the sky. 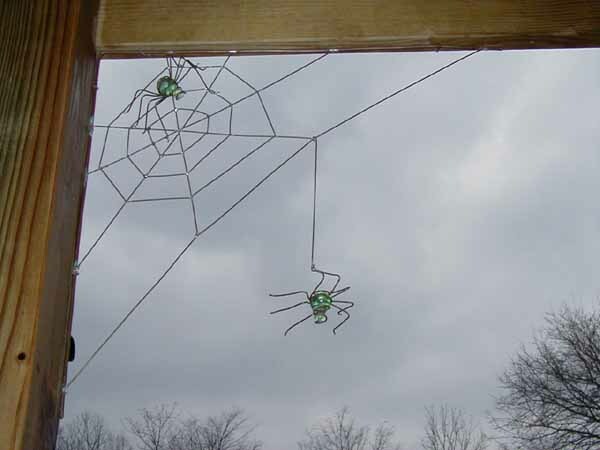 It shows up best this way but you can hang one in a doorframe or window too. 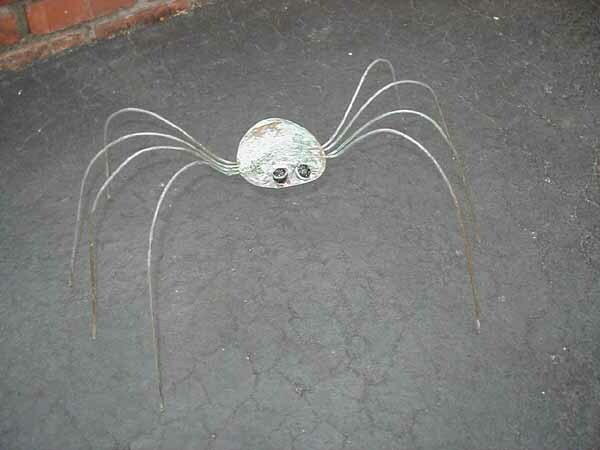 Note: his legs extend about 12 inches through the bottoms of his feet. 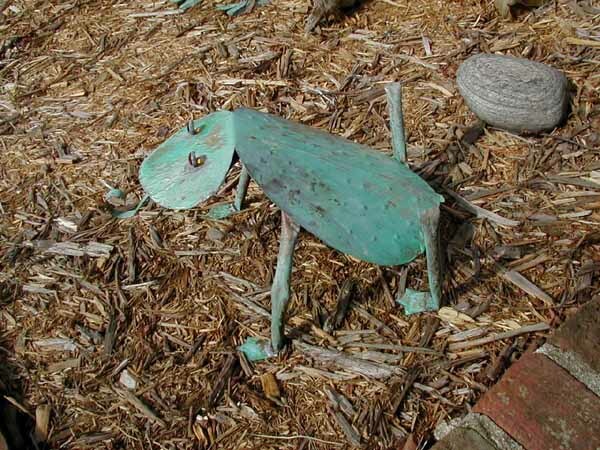 This allows him to be "planted" in the dirt and he is self supporting. He really glares at trespassers! This is one of my most elaborate critters. 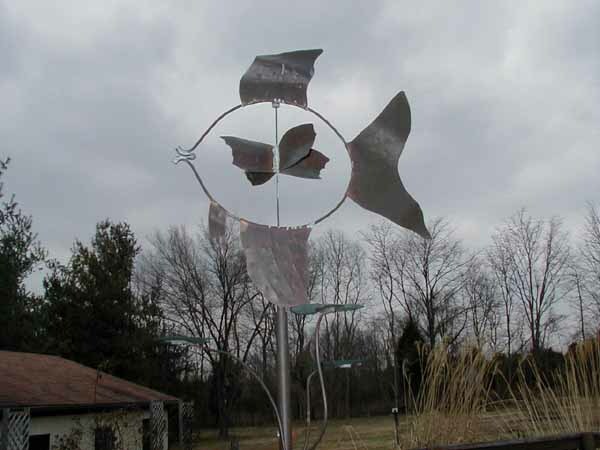 The fish weathervane has rotating fins that spin with the wind and he rotates to point into the breeze like any good weathervane should! 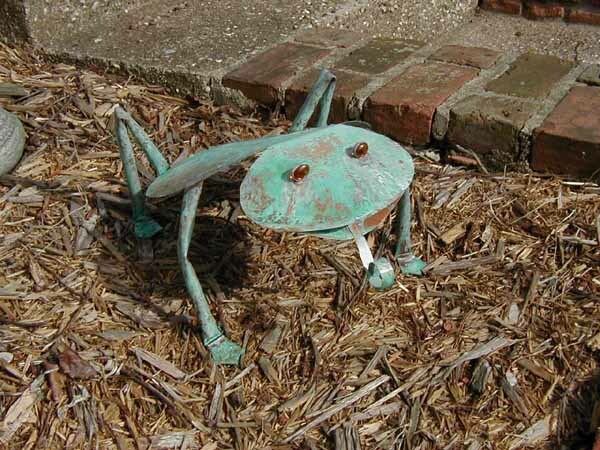 This garden frog has 1/2 copper pipe legs and feet with glass glob eyes. The body is snipped from copper flashing material. This frog gets his "warts" by banging his under side with a ball peen hammer! 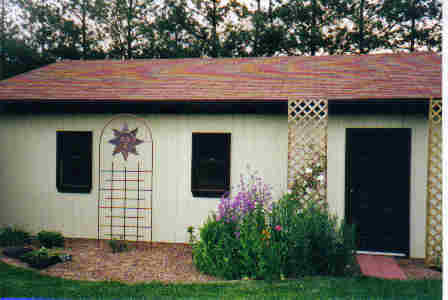 This is another favorite and not too hard to build. 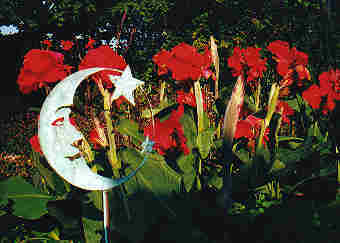 The moon and stars is about 16" in diameter. 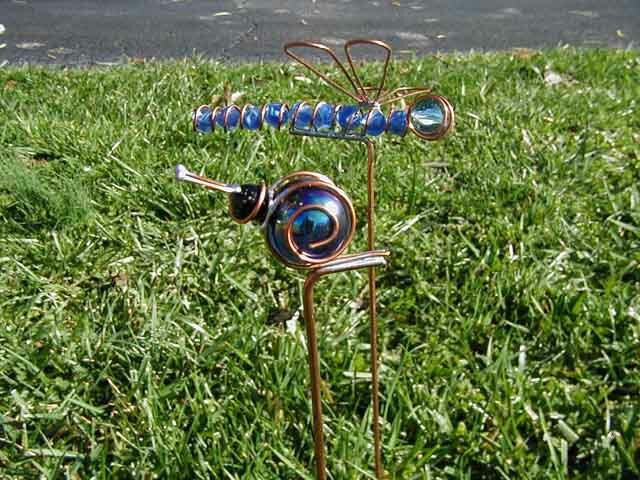 It stands on a piece of 1/2" copper pipe and uses #4 copper wire around his face. This is my most elaborate project but worth all the work! 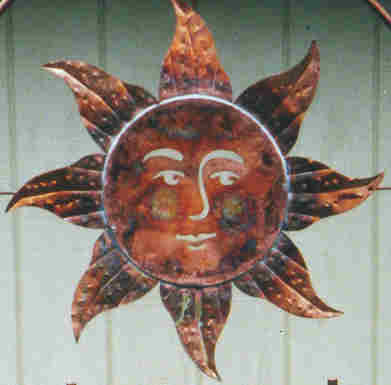 I've built several Smiling Sun faces that stood alone like the moon in the previous picture. I also built this Sun Trellis for our climbing rose to hang on to. Once again, it's all just 1/2" copper pipe and copper flashing material. That's all of the copper critters for now. 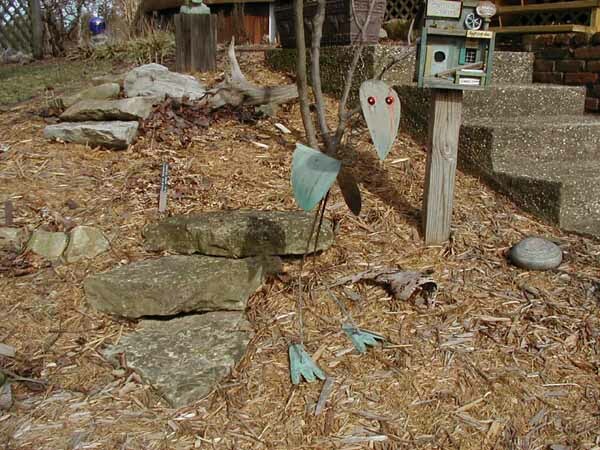 Check back again some day because I'm always adding flowers and "critters" to our gardens. Drop us a line and tell us where you're from. 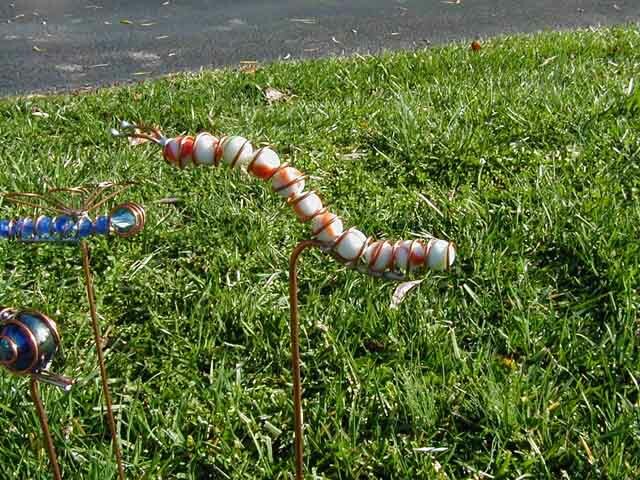 We'd love to hear how your copper critters turned out! "I feel closest to God when I'm sitting in my His garden". I welcome email from my friends! You are invited to click the mail-dove to send me a message OR you may hand type my address into your message. My address is "dan at ky-dan dot com". It looks funny when written out this way but it should fool those darn spammer robots that visit web sites gathering email addresses. This neat little counter thingie started at zero then. You are visitor # since that day. Thanks for stopping by! !